Join us on Saturday, May 18th, 2019 as we lend a hand to our partners at the Forest Restoration Alliance. We will be helping out at the FRA greenhouse and research facility near Waynesville, NC. 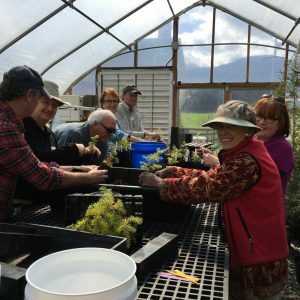 Activities could include transplanting hemlocks, weeding outdoor growing areas, and cleaning in the greenhouse. Volunteers will also get a tour of the facility by researcher Ben Smith and learn about their efforts to restore hemlocks. The work day will be from 10 am to 4 pm at the Mountain Research Station in Waynesville, NC. To register, please fill out our volunteer sign up form by Monday, May 13th. More information about the meeting location and what to bring will be provided after registering.